Posto or Poppy seed is a beloved spice in any Bengali household. 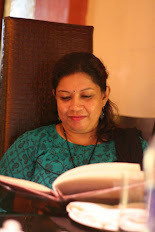 They are quite expensive compared to other spices but that cannot lessen our love for posto. We make all sorts of posto recipes like Aloo posto(potato cubes cooked with poppy seed paste) which is known to the whole world. We also make similar side dish with ladies finger(Bhindi posto), Pointed Gourd or patol posto and so on. This is also added in other dishes made with vegetables or fish and even in chicken. Other than these, we also make a fritter made only with poppy seed or posto which is known as Postor Bora. 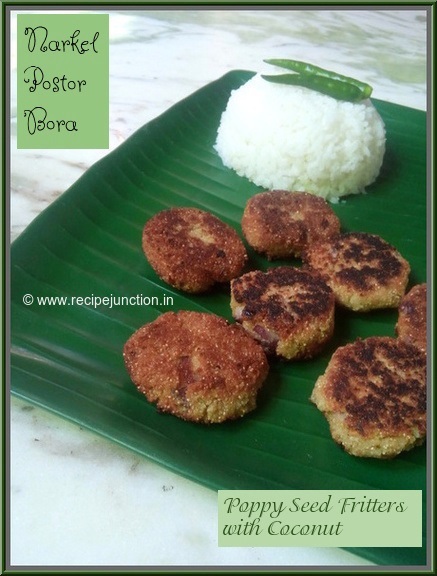 Today I'll share the recipe of Posto'r Bora but with an addition of another ingredient, which is also very beloved to bengalis, Coconut. 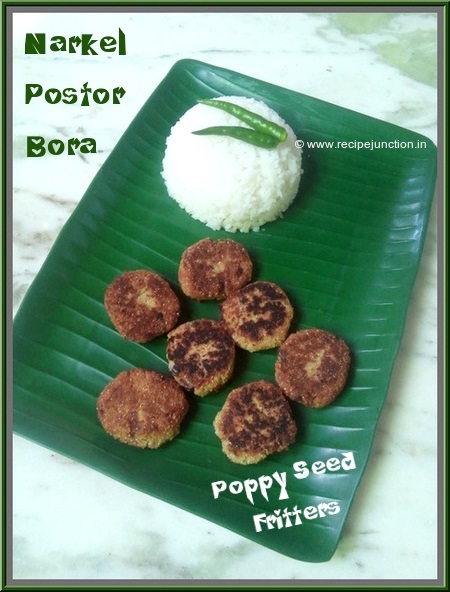 So, it is Narkel Postor Bora or Coconut Poppy seed fritter.The best combination to have these with hot rice and a lentil(dal) by the side. But you can also enjoy only with warm rice, it is heaven on plate. Oil(for frying) : 3-4 tblsp. Soak poppy seeds in little warm water for at least 1/2 an hour. More the better. Make a smooth paste adding green chillies in it. Grate the coconut as fine as possible. Now in a bowl, take poppy seed paste, chopped onion, rice flour and salt. Mix everything and prepare a fine paste which should not too soggy(wet) nor too dry. If you feel your mixture is soggy, add little rice flour and combine it again. Now heat oil in a frying pan for shallow frying, no need to deep fry these fritters. Make a round patties like shape from the mixture and drop those patties into the oil. In medium flame carefully fry them till they are golden brown from both sides. Do not fry them in high heat, that will make the fritters taste bitter. Remove on a paper towel to absorb the excess oil, serve before it get cooled. You can also serve these with evening tea/coffee. But it tastes best when served with freshly made rice and dal. Try to believe........You'll love it, guarantee you that.